Should ewes and does be bred to produce their first offspring at approximately one year of age? Or should you wait until they are yearlings to breed them for the first time? The answer depends. There are many factors to consider and pros and cons to each breeding decision. Breeding ewe lambs and doe kids allows you to exploit their reproductive potential. It is well-documented that ewes that are mated as lambs will have a higher lifetime production than ewes that are mated for the first time as yearlings. At the same time, ewe lambs and doe kids have lower conception rates, give birth to fewer offspring, produce less milk, and are more likely to experience problems at the time of birthing. In addition, there may be sacrifices in growth. Ewes and does that are bred early may not catch up (in weight) until their second mating. For this reason, producers who show yearlings often delay breeding. 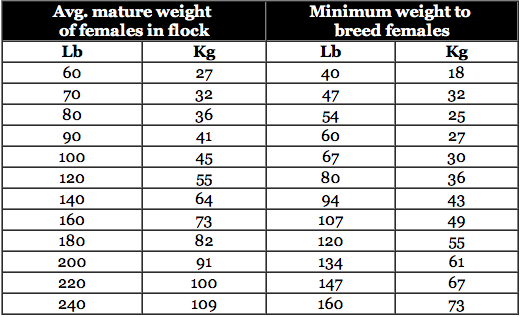 Size (weight) is a more important consideration than age when deciding if/when to breed young females. Ewe lambs and doe kids should achieve approximately two-thirds of their mature weight (at the start of the breeding seasons) before being bred. It is often necessary to feed some grain to get ewe lambs and doe kids big enough for breeding. At the same time, ewe and doe replacements should not be fed for maximum gain, as this has been shown to be detrimental to future milk production. Though heavily influenced by nutrition, ewes and does vary in the age at which they reach puberty (sexual maturity). Some breeds of sheep may not reach puberty until they are almost a year of age. Crossbred females usually reach puberty earlier than purebred females. Ewe lambs born in the fall are not likely to conceive until the next fall. It makes sense to breed ewe lambs and doe kids away from the main flock, as they are less competitive for the male’s service. Ewe lambs and doe kids should not be bred to males with large birth weights or heavy front-ends. They should be bred to males from the same (or smaller) breed. Nor should they be mated to large males that could cause them injury. Because pregnant ewe lambs and doelings are still growing, they have higher nutritional requirements. They are also less aggressive at the feed trough. For these reasons, they should be fed and managed separately from mature females. In fact, they should not be mixed with the mature flock until they have weaned their first offspring. Yearlings that are nursing offspring, especially multiples, should be more closely monitored for signs of parasitism. With good management and nutrition, producers can successfully breed ewes and does to produce offspring at approximately one year of age. Without good management and nutrition, breeding ewe lambs and doe kids can be disastrous. Susan Schoenian is the Sheep & Goat Specialist at the University of Maryland’s Western Maryland Research & Education Center in Keedysville, Maryland. She has been with University of Maryland Extension since 1988. Susan began her extension career as an agricultural extension agent (“county agent”) in Wicomico County, Maryland. She also served as a Farm Management Specialist for Maryland’s nine Eastern Shore counties. In addition, she operates the Sheep 101, Sheep 201 and Maryland Small Ruminant Page websites.